I finished my Eucalan bottle a few months back, almost at the same time that I found back an old-but-still-almost-full bottle of Soak Wash. Perfect isn’t it? Before I empty the bottle, let’s give it a good test! As I wash by hand quite a lot, I do love rince-free (non-scented) washing-liquids. This one was a gift from a LYS when I almost emptyied my bank account one day so it’s in the Lacey sent. 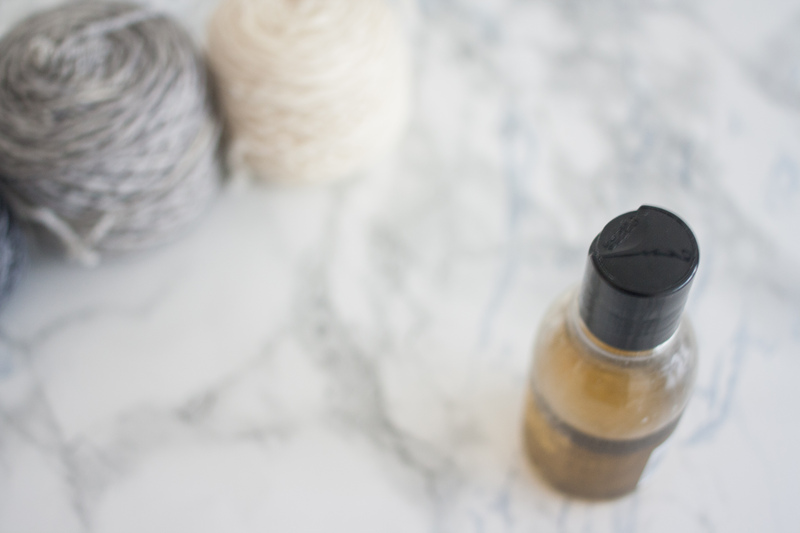 I’ve explained how I take care of my knits in this previous article but basically, I do handwash once all of my handknits and silk. Soak Wash, what’s in the bottle? coco-glucoside, sodium cococamphoacetate, lauryl glucoside, sodium cocoyl glutamate, sodium lauryl glucose carboxylat, ethylhexylglyercin: surface-active agents, considered among the least irritate surface-actives for the skin. glycerin: cleaning agent and softener. glyceryl oleate, PEG-7 glyceryl cocoate: emulsifiers. parfum — if you choose the unscented one, you can remove that from the list. The sent from the Lacey one does wear its name pretty well. It is almost sentless but does have a subtil clean lingerie perfum if you can see what I mean. tetrasodium EDTA (tetrasodium Ethylene-Diamino-Tetra-Acetate): stabilizator and preservative, non-biodegradable. citric acid: acidifier and descaling agent. All in one, the Soak Wash contains almost only high ranked components. The only two ones that really trouble me are tetrasodium EDTA and benzophenone-4. While doing researches to write this article, I’ve came across different reports saying that it’s not biodegradable and it can’t be filtered by carbon-based filters. Which means we can find it in our tap water. As for the Eucalan wash, the Soak Wash is advertizes as a no-rince wash. But as for the Eucalan wash, I do rince mine. I have a very sensitive skin and “Better safe than sorry” is my motto when it comes to cosmetics, soaps and detergents. Compared to the Eucalan wash, its composition is really cleaner and better in term of skin irritation and environmental impact. If this is your main criterium, I would recommand to choose the Soak Wash.
Their bottles, caps and labels are made from recycled materials and all of their inks are water-based. Pretty dope, am I right? My only critic would be about the cap itself. It’s a push-to-open cap, which is fine for a stay-at-home bottle but which can be a bit tricky in a fully overload packed bag. I’ve knitted my sample in Le Chat qui Tricote Chamaille Naure, on 4mm square needles and applied the same stains as in my previous test. Browsing in a clockwise path, we have: blue ink, haselnut and chocolate paste, grape pip oil and chicory-coffee-milk. I’ve impregnated the sample and let it dry a couple of hours before washing it. I’ve added a final rinse because that’s how I wash my handknits. 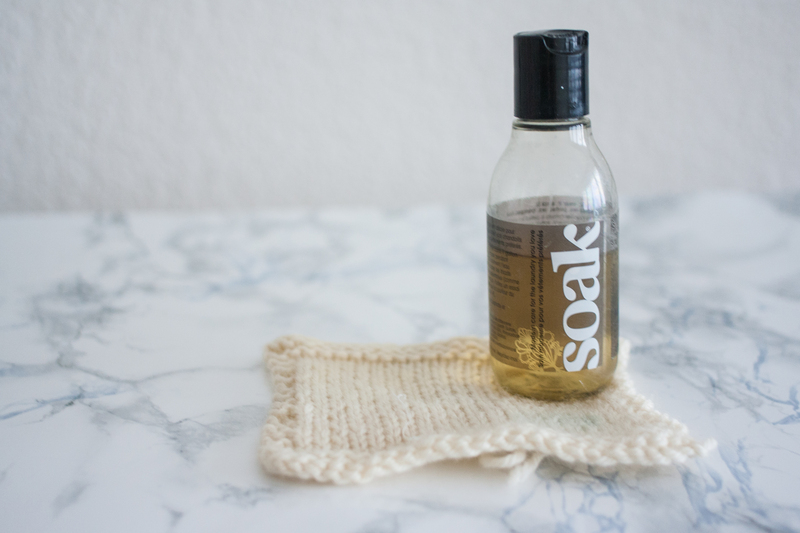 The Soak Wash is carried is a lot of LYS but you can also order online in Amazon(*) in all the different packaging and sents.